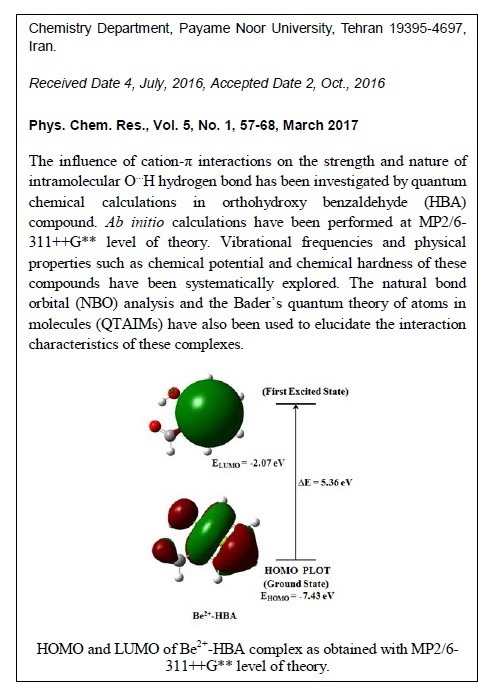 The influence of cation-π interactions on the strength and nature of intramolecular O...H hydrogen bond has been investigated by quantum chemical calculations in orthohydroxy benzaldehyde (HBA) compound. Ab initio calculations have been performed at MP2/6-311++G** level of theory. Vibrational frequencies and physical properties such as chemical potential and chemical hardness of these compounds have been systematically explored. The natural bond orbital (NBO) analysis and the Bader’s quantum theory of atoms in molecules (QTAIMs) have also been used to elucidate the interaction characteristics of these complexes. The intramolecular O...H hydrogen bond has been putted in the categories weak to medium in the investigated systems. 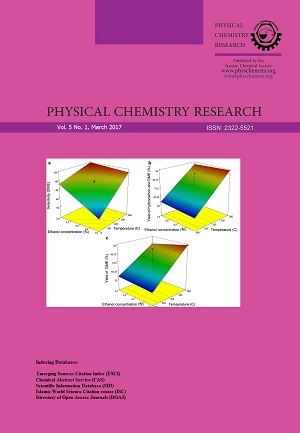 The results obtained from calculations and the topological parameters derived from the Bader theory suggest that the strongest interaction and the highest electron density at BCP (bond critical point) are related to the Be2+-HBA complex. The HOMO–LUMO energy has also been evaluated. Furthermore, numerous correlations between topological, geometrical and energetic parameters have been found.